As society continues to seek an understanding of the digital age by rational means, Ida Kvetny’s work offers a dark alternative: a Surrealist aesthetic united with dystopian visions of the modern world. Drawing on fantastical imagery and a psychedelic visual vocabulary, Kvetny tackles the digital age with what she refers to as an “ancient language that transcends time, place and culture”. In this engagement with the irrational mind, the paintings and sculpture of Surreal Universe are inspired by Freud, who compared himself to an archaeologist, digging away at layers of the psyche to reveal our deepest thoughts. 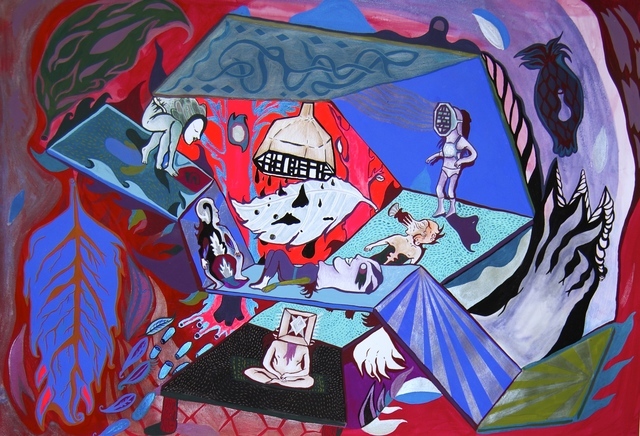 Freud’s theories underpinned the work of the original Surrealists, and the way in which they sought to make visual sense of the irrationality of war, but Kvetny’s practice has a visceral contemporaneity, drawing on other influences such as comic books, pop art, and Abstract Expressionism. Kvetny also engages with the way in which we receive information in the 21st century, building up a vibrant schema of Surrealist symbols in order to echo the frenetic visuality of cyberspace. We are drawn into a virtual world where imaginary cities unfold before our eyes, populated by vast structures, plants, and otherworldly creatures; “a flood of images and ornaments interlaced with potent and socio-political statements”. The artist wants us to be absorbed in these details, getting lost in the combinations of rich pattern and colour, branching from deep purple and blue, to bursts of scarlet and forest green. The paintings recall the night-time dreamscapes and violent fauna of Marc Chagall, Max Ernst, and Leonora Carrington (the subject of a groundbreaking retrospective at Tate Liverpool in 2015). Alongside the paintings are small figurines, which Kvetny refers to as ‘fossils’, excavated from her paintings as physical embodiments of the universe that she has created – a unique universe of contemporary surrealism for the Internet age.